In PGO’s post, Saddam to Die Tonight 10 PM, @ Atlas Shrugged,she updates to the BBC News article, Saddam Hussein executed in Iraq. But it’s the lead picture ofPamela’s post that’s most riveting. She updates a second time with this, “BTW, Gateway has the whole nasty business on Saddam here, you must see it. A horrible dictator and that’s the least of it”. The Butcher of Baghdad dies in his own torture chamber. 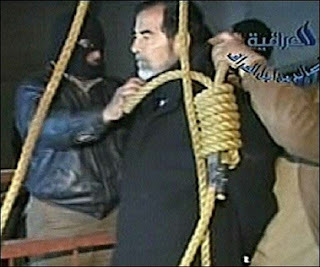 Video of the hanging of Saddam Hussein **HERE**. This entry was posted in Uncategorized on December 30, 2006 by Dan.